ProQuartet partners with the Académie Ravel for a chamber music workshop with Bernhard Schmidt from the Quatuor Mandelring from August 28th to September 10th. 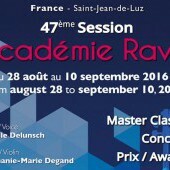 The Académie Ravel has received many young talents, now internationally famous. About fifty students of all nationalities upgrade their knowledge and deepen their interpretation of French music of the 20th Century and of classical, romantic and contemporary works. The Académie Ravel emphasizes public interpretation courses (over 90 hours). Open to all, they allow for an accessible, original and easy approach to music.